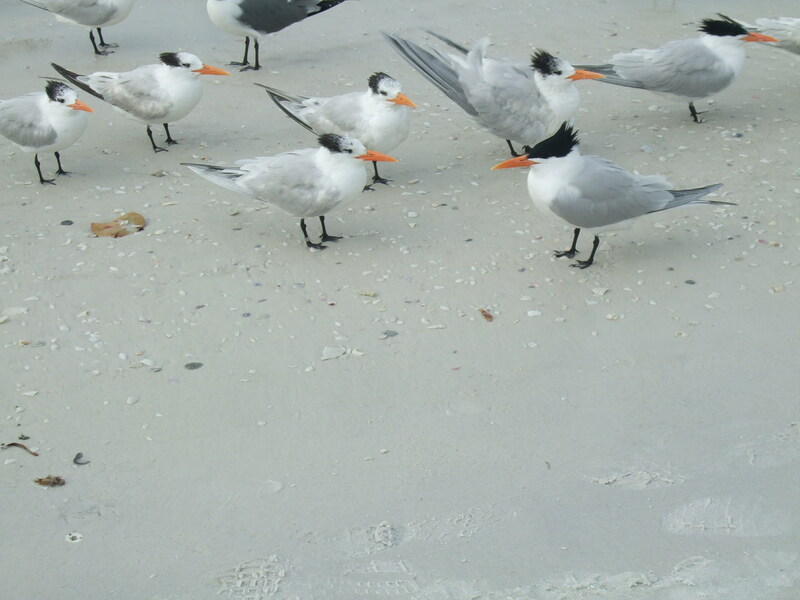 Seabirds on the beach at Anna Maria Island, Florida. Yes, we’ve been on the beach in my old stomping grounds, the west coast of Florida — Bradenton and the island of Anna Maria, where we rented a couple of very nice beach houses. (I was a Florida boy from age 8 through high school.) In the first house, we spent a week with good friends, and in the second home we lived with son Michael and daughter Anne, and their partners Vanessa and James. It was a great reunion of friends and family, with lots of celebration of important birthdays — including the 90th birthday of my amazingly young mother, Betty. If the upside was fun, friendship and good feelings, the downside was that I managed to get very little exercise while packing in a large amount of food, resulting in a surprisingly big gain in my weight. So now it’s Boot Camp — a rigorous program of (occasional) exercise, and a return to the sensible eating habits that we’ve generally maintained since moving to France. The key? Normal breakfasts, followed by the day’s major meal at lunchtime, with a very small dinner. To kick off this new regime properly, we had lunch today at Daglan’s own Le Petit Paris, and restricted ourselves to the two-course lunch — a main course, followed by dessert. So we’re well and truly back in the Greater Daglan Area. Stay tuned, because tomorrow I’ll report on today’s lunch. This entry was posted in Flora and fauna, French food, Life in southwest France, Travels in and out of France, Uncategorized and tagged Anna Maria Island, Bradenton, Daglan, desserts, Florida, food, le petit paris, restaurants, travel, vacation, vacations. Bookmark the permalink. 3 Responses to Back in the GDA, again! So glad you are back – was beginning to wonder where you were!! Looking forward to reading more of your food adventures!! Thanks, Joan! And I’m looking forward to enjoying more food adventures!